Domino’s Pizza continues its “The Official Food of Everything” campaign, from agency VCCP, with a new installment, showing that Domino’s is “The Official Food of the Night in Before the Night Out”. 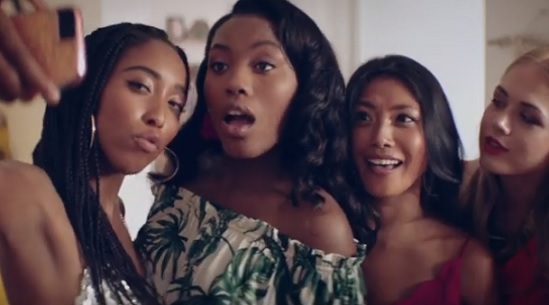 The 30-second spot opens with a group of four girlfriends taking selfies before going on a night out, but – instead of following the young ladies into the city – it continues by showing their “getting ready” ritual and the moments of calm they enjoyed with Domino’s Pizza earlier in the evening. Through rewinding images, viewers are taken back in time and given a glimpse into the girls’ process of choosing outfits, waxing, putting on cleansing masks, as well as into their lounging on the sofa, in front of the TV, with Domino’s Pizza. Scored by Roy Orbison’s hit single “Oh, Pretty Woman,” the advert ends with the onscreen line “The Official Food of the Night in Before the Night Out” and with the chain’s tagline, “The Official Food of Everything”. First launched in 2017, “The Official Food of Everything” campaign was brought back to the small screen, for its second year, earlier this fall, in September, with a spot that was the first of a new series of four TV spots. Released with the slogan “The Official Food of Never Again… Until Next Year,” the 30-second advert featured two parents in shock after assessing the damage caused to their apartment after their kid’s birthday party. Set to the tune of “The End Of The World,” the ad aims to present Domino’s Pizza as the perfect antidote for that situation.